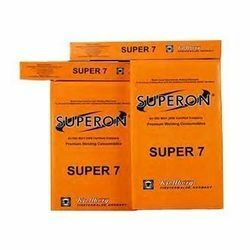 Our product range includes a wide range of superon super 6 (6013), superon super 7 (7018) electrode and superon superhard 550 electrode. Rutile type medium coated mild steel very easy to handle universal electrode. Applications in steel construction, ship building, boiler, tank fabrication and pipeline construction. Excellent weldability, very low spatter, smooth arc, fine rippled seems, self lifting slag, good strike and re-strike. Welds are of radiographic quality. 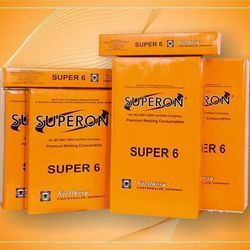 Superon Super 6 E6013 comes with ISI marking. & offshore work. Low moisture absorption properties (LMA- type). Packaging : 1 Box of 20 Kgs contains 5 packets of 4 Kgs each. Hard surfacing electrode for tough - hard, impact tough And abrasive resistant surfacing on unalloyed and low alloyed materials with higher tensile strength. Recommended For surfacing on machine parts, dredge teeth, beater bars, conveyor worms, mill hammers, mixer arms, crusher jaws, cones. 1 Box of 20 Kgs contains 4 packets of 5kgs each. 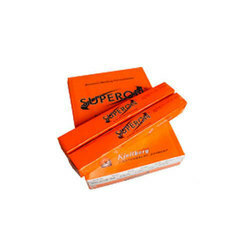 Looking for Superon MS welding electrodes ?